We provide high quality bilingual media training for the private, public and voluntary sectors. Being able to give authoritative and convincing interviews to print and broadcast media is an essential element of communicating. Our media training is challenging and realistic. We give our clients practical training on how to be confident when they meet the media giving them the ability to get their key message across and present a positive image. Our experienced media trainers are all trained broadcast journalists, presenting and reporting on commercial and BBC radio and television main news, political and current affairs live programmes. They include Penny Roberts, former BBC Wales Chief Reporter for almost two decades; Sara Edwards, Welsh speaker, BBC main news anchor for over 15 years; Mai Davies, Welsh speaker, ITV Political presenter, main Sky Newsreader and BBC current affairs presenter; Frances Donovan ITV and BBC news presenter and many more. A full list of our high profile broadcasters can be found here. Our media trainers have been the ones asking those difficult questions over the last two decades and are best placed to prepare effective answers for all radio and television interviews on challenging issues. We offer stimulating and challenging media training giving everyone who deals with the media the confidence to handle enquiries and interviews. They show how to positively structure effective key messages and develop a powerful communications strategy. Individually designed to meet your specific requirements, all our programmes give you consistency and control and we can also help hone and enhance communication skills further with refresher or advanced training. We offer specialist presentation skills training to banish the nerves that often lead to the inability to get your key message across. Voice and body language coaching is offered as part of this training and our cameramen and editors also have vast experience in producing dvds of the highest quality. Our Media Training is led by Welsh Speaker, Mari Waddington – our communications specialist and presenter. 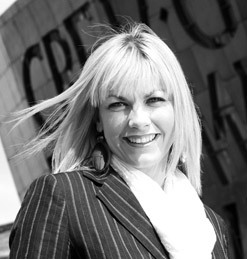 She is an experienced media facilitator who has managed media training for many major organisations and has acted as spokesperson on behalf of clients on both Welsh and English national TV.